Aaron Kotranza has led the development of mixed reality humans.� A Mixed reality human is a new type of virtual human that allows touch between a human and a virtual human character.� We are working to develop mixed reality human patients to allow medical profession students to practice their communication and interpersonal skills during clinical examinations.� Preliminary study results show that allowing touch between the student and the virtual patient causes the student to use touch to comfort the patient and to communicate in a more socially engaged manner.� Mixed reality humans also enable the simulation of intimate exams, such as breast and pelvic examinations.� We are working to integrate mixed reality intimate exams into the educational curriculum of medical students at MCG. � A. Deladisma, M. Gupta, A. Kotranza, J. Bittner, T. Imam, D. Swinson, R. Nesbit, B. Lok, C. Pugh, D.S. Lind. "A Pilot Study to Integrate an Immersive Virtual Patient with a Breast Complaint and Breast Exam Simulator into a Medical Student Surgery Clerkship." Presented at Association from Surgical Education Surgical Education Week 2008. Andrew Raij has led the development of IPSViz (Interpersonal Scenario Visualizer), a tool that enables end-users to rapidly review, evaluate and get feedback on interactions with virtual humans. 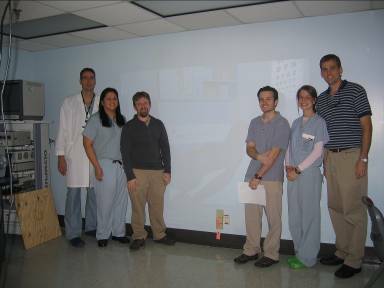 IPSViz generates visualizations that allow students to review medical communication skills, as well as verbal and non-verbal behavior. Skills and behaviors represented in IPSViz include head gaze, body lean, interpersonal distance, diction, rapport, listening, information-gathering, interrupting the patient, and interview organization. Brent Rossen is leading studies as to the degree that real world biases (e.g. 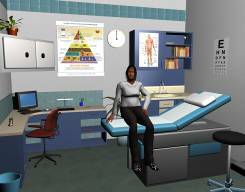 skin-tone or weight) are transferable to the virtual world.� His work his shown that sub-conscious biases are realized in the virtual world and these biases are detectable, measurable, and correlated to psychological measures of bias.� For example, in the two virtual humans below, an African-American virtual patient was rated as having lower education and lower income/health-insurance than the Caucasian virtual patient, despite the experiences using the same scripts, animations, audio files, and 3D models (with different textures). 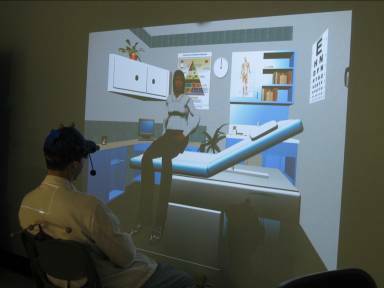 Kyle Johnsen has led the evaluation of how the display of the virtual human affects the interaction with a virtual human.� Specifically, HMDs and monitors significantly alters self-perceptions of the interactions (further from observer ratings) than life-sized fish tank VR displays.� Other components that have been studied include audio quality, wizard-of-oz techniques, and physical devices. Large scale visualizations of H-VH interactions, fast-iteration H-VH script development, public space deployment of VH technology, and course integration of VHs.